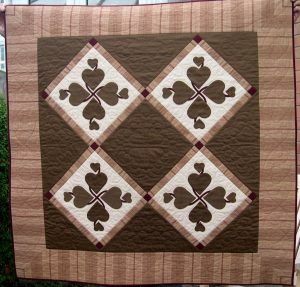 Many of my projects are for small to medium sized quilts which can be used as wall-hangings or lap quilts. Most of those displayed below are available as patterns for you to make up in your own choice of colours – look in the Shop or ask for details via the Contact Me page. 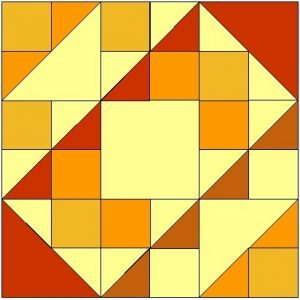 This is one of the simplest blocks possible, consisting of four small units; two half-square triangle units and two four-square units. 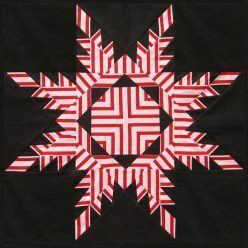 However, a number of different designs can be made from it, depending on which way round the little blocks are arranged. 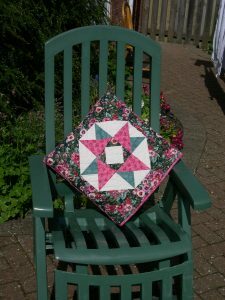 Four blocks together make an effective cushion cover. 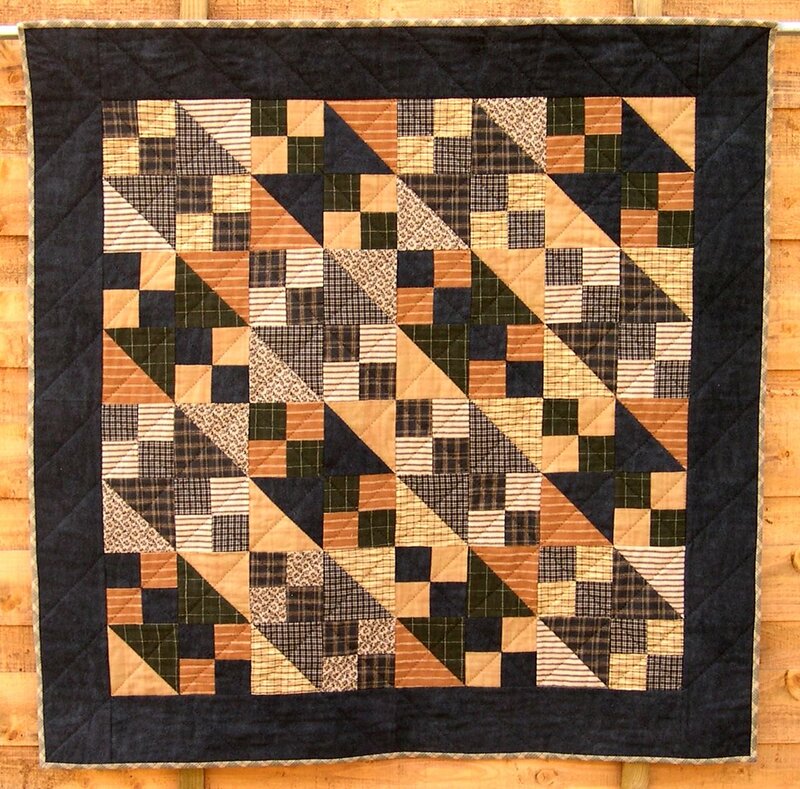 In the small quilt below, made from flannel and plaid fabrics, all the blocks are arranged the same way round, giving an overall diagonal feel. Buckeye Beauty – yet another variation on Northern Lights. Isn’t it amazing how many things can be done with one simple little block? 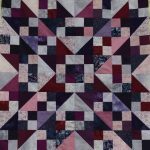 This project was the first where I started to develop “quick-piecing” techniques to save time and fabric, and to give more accurate results. Can you work out where the 5-patch block is? (There are four of them plus a plain brown border). 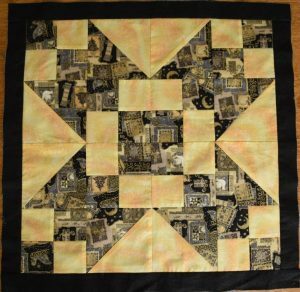 I had made this block for a Sampler Quilt, and used a well-known quick-piecing technique known as “flip corners” to make the flying geese units. 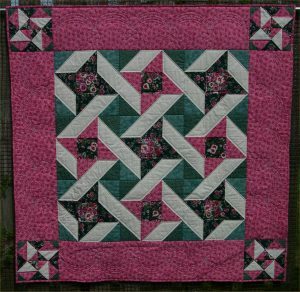 This method seemed wasteful however, as the corner triangles are discarded, so I adapted it to use slightly lager squares, in a way which created extra half-square triangle units instead – and these were used to make a pieced border. Do you remember the craze in the early Seventies for creating curved designs by winding silver thread round nails to create straight lines? 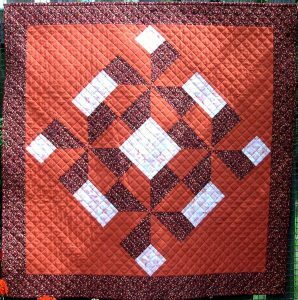 A geometric design using the same principles was machine-quilted onto the Jack-in-a-Box quilt. It is actually just made up of squares of ever-decreasing size, but makes a very effective spiralling design. For more details, click to go to the Jack-in-a-Box page. 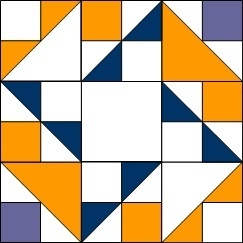 This little quilt uses similar quick-piecing techniques to Jack-in-a-Box, also creating extra half-square triangle units to make a pieced border. 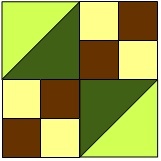 Can you see how each colour pair in the border matches one from the centre? 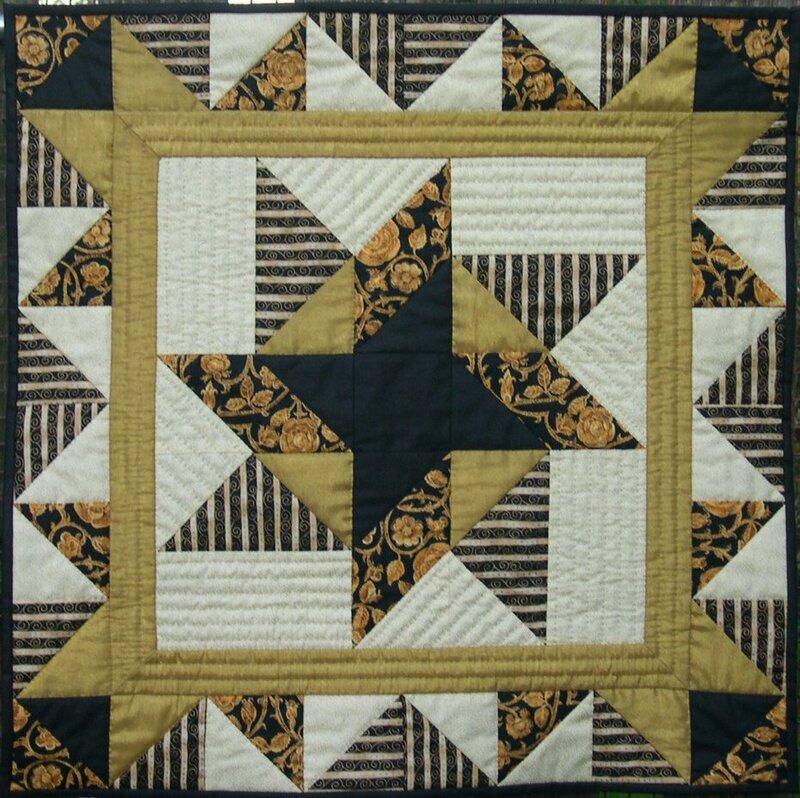 The way the units are put together to make the border is different however – in Jack-in-a-Box, all the half-square triangles are arranged to point the same way, flowing smoothly around the entire quilt – but here, the arrangement is different, giving a livelier effect (augmented by the careful placing of the striped fabric). 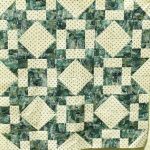 No matter how carefully you plan, cut and stitch, as fabric is taken up in seams, or can stretch, making a pieced border to be exactly the right size to fit a central block can be tricky. 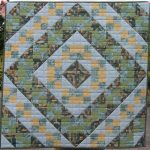 The trick is to use a plain spacer border in between, and adjust the size of this to fit the finished block and border – much easier. 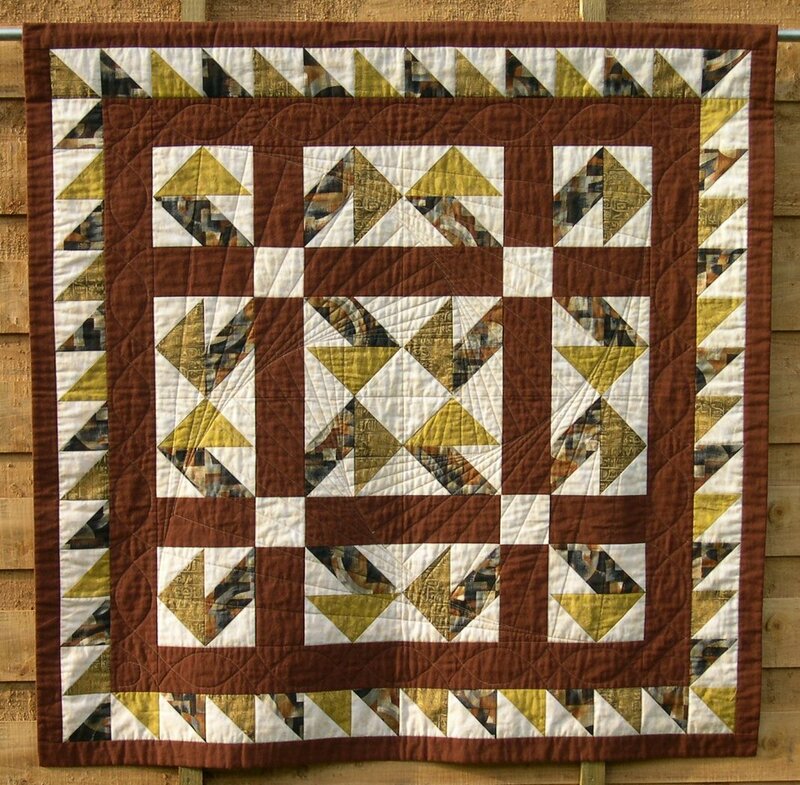 If you would like to experiment with creating pieced borders like this, use the Contact Me Form to ask about my Perfect Pieced Borders pack. 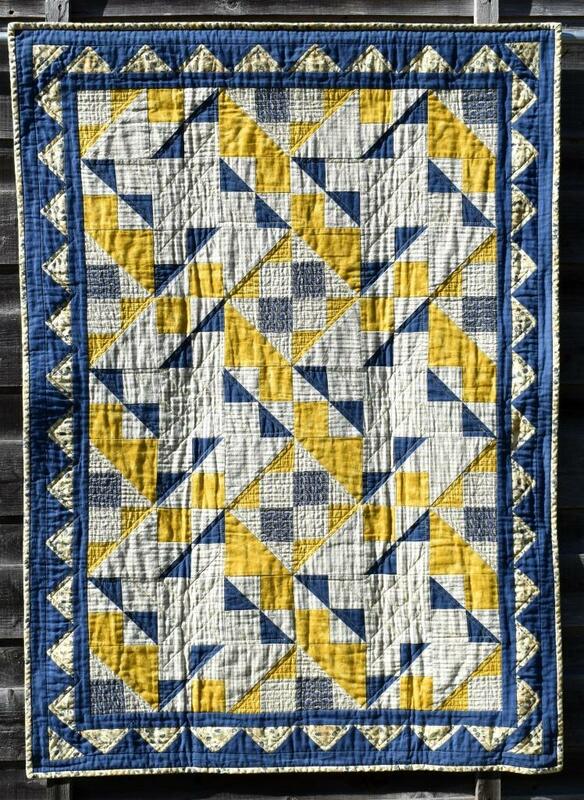 This large wallhanging was originally published as a Mystery Quilt in The Quilter (the magazine for Quilters’ Guild members) during 2004, their twenty fifth anniversary year. Roman Pavement followed a smaller Mystery Quilt which was originally produced in “The Quilter” during 2000 and 2001. 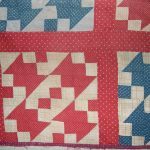 When I was planning this, one of the earliest quilts I made with no obvious recipient, my husband was naive enough to ask “Why do you want to make another quilt?” The quilt acquired its name as he gradually realised that how silly a question this was……..
My design process is probably very different from most other quilters. 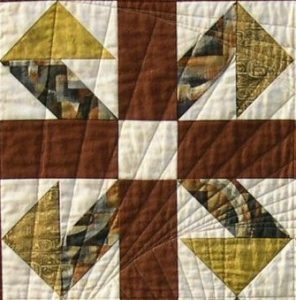 I had been fascinated by a method for quick piecing a small unit in a book called “Start with Squares”, but didn’t like the way it produced units with the grain in the wrong place. 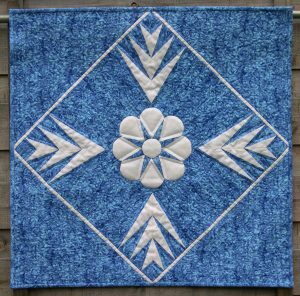 Tinkering around with the method gave better results, another slightly different unit – and a design for a little quilt. 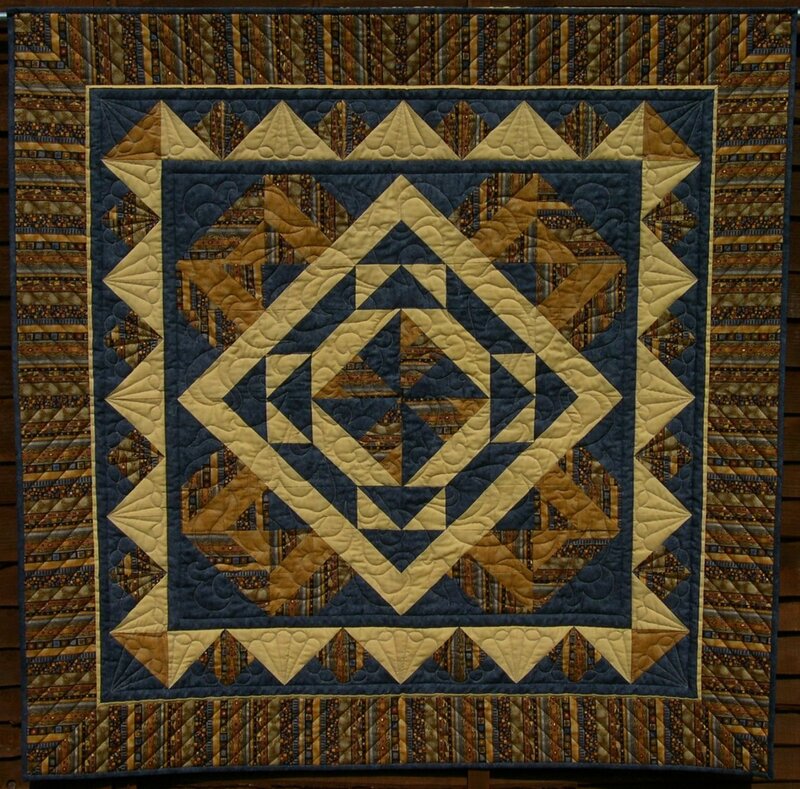 Can you see how many blocks there are in the quilt? It interests me that when set flush (repeated blocks directly next to each other with no sashing), the dominant features look different compared to a single block. An “over and under” diagonal ribbon effect appears when the blocks are combined. 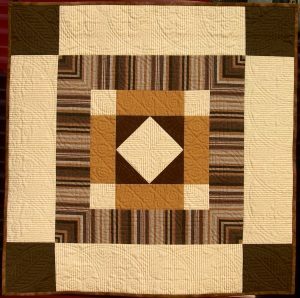 This design also demonstrates how small changes can create a new block. Look at the units in the middle of each side of the Mike’s Nightmare block. If just two of these are turned through 90°, the block now has a diagonal feel. 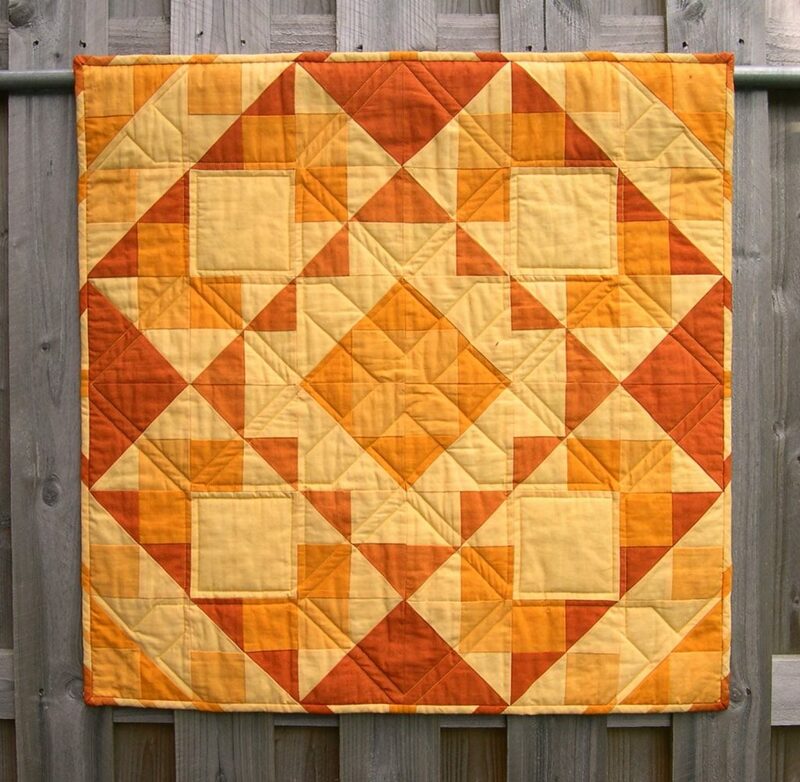 I adjusted the colours a little, and combined four blocks to make this little quilt for a Quilters Guild Challenge which required the use of five shades of one colour (I had a long debate with myself as to whether “dark orange/yellow” really went as far as terracotta!). 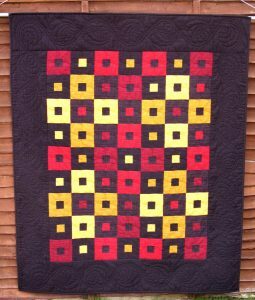 Would you have guessed this little quilt essentially uses the same block as Mike’s Nightmare?! 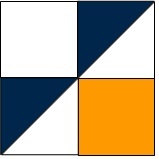 Look carefully, and you will see how the new block has been rotated so the diagonal direction changes each time. The block structure is thus disguised. This is an example of the way that diagonal blocks have so much design potential as they can be rotated and combined in many different ways – but as they look rather odd on their own, people usually choose blocks which look good by themselves. Why not experiment with other diagonal blocks? 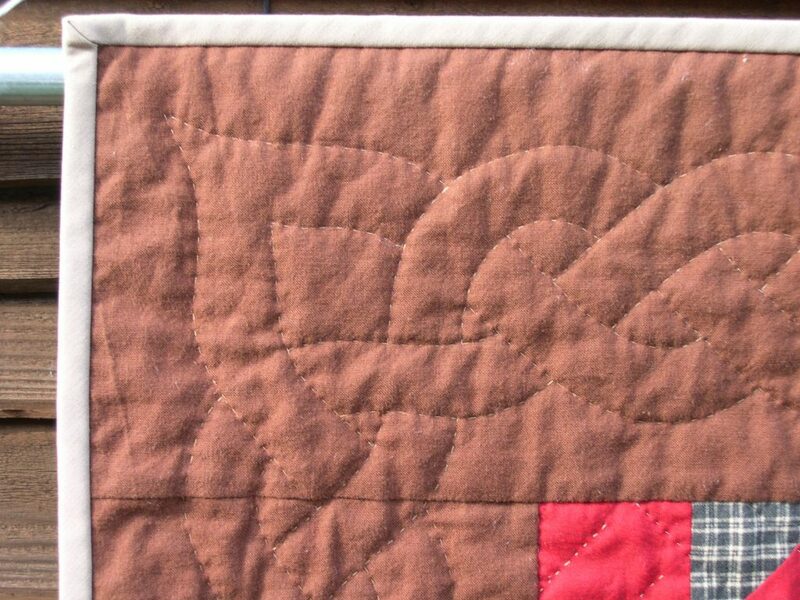 Do you like the pieced binding, by the way, which used the very last scraps of the fabrics that I had hand-dyed? 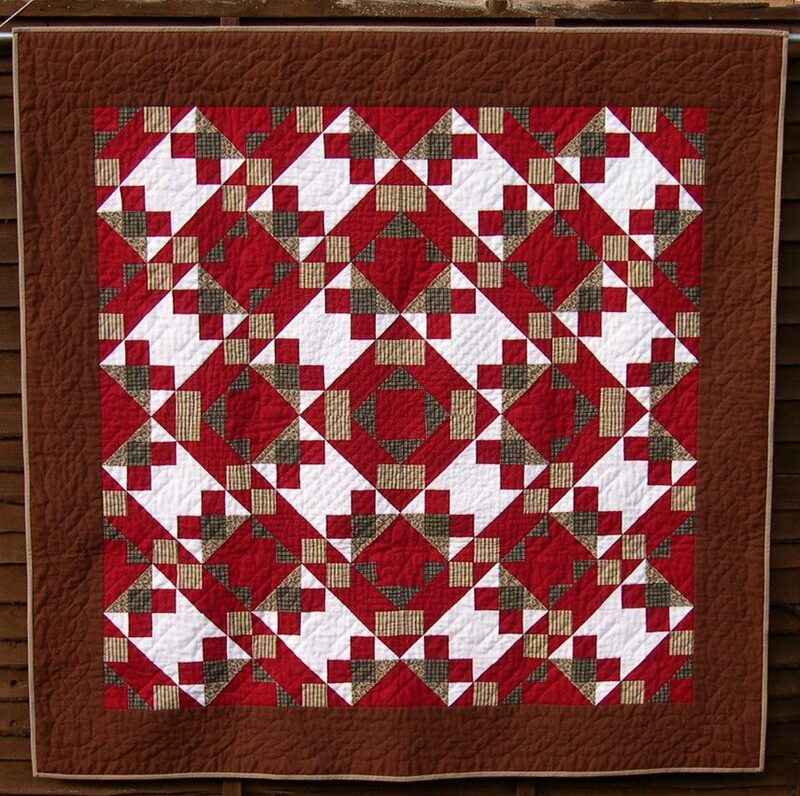 The Colour Challenge block was adjusted and recoloured again to make yet another quilt, made with plaids and flannels in a warm, winter colour scheme. Can you identify the block here? 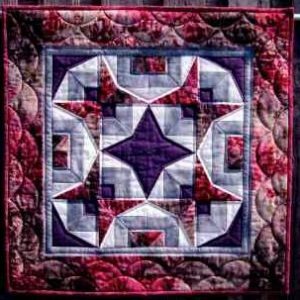 There are sixteen in this larger quilt, again with the direction of the strong diagonal manipulated to give an interesting overall design. The images below show some of the other small quilts and wallhangings that I have made – more information to follow!